My ancestry traces back to a dog named Chinook who was born back in 1917 on a farm belonging to Arthur Treadwell Walden. 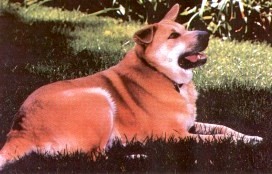 Chinook's mother was a Husky and his father was a mixed breed of large build and stature. His name came from the word �chinook', referring to the warm wind that blows at times in Alaska. My coat is thick and double, but doesn't require elaborate grooming talent. I am a strong dog, but I am not an aggressive type. I get along well with children, especially if I grow up with them. When fully grown, I am between 21 and 26 inches tall (53.3 to 66 centimeters) and I weigh between 65 and 90 pounds (29.3 to 40.5 kilograms). We have no Chinook Breeders listed at this time. Click here to place your Chinook Ad!